Wednesday September 27 2017, 7:00-10:00 pm. Harvey Diamond, piano; Jon Dreyer, bass; Joe Hunt, drums. Asian fusion food and a full bar at Thelonious Monkfish, 524 Massachusetts Ave, Cambridge MA. Reservations recommended. 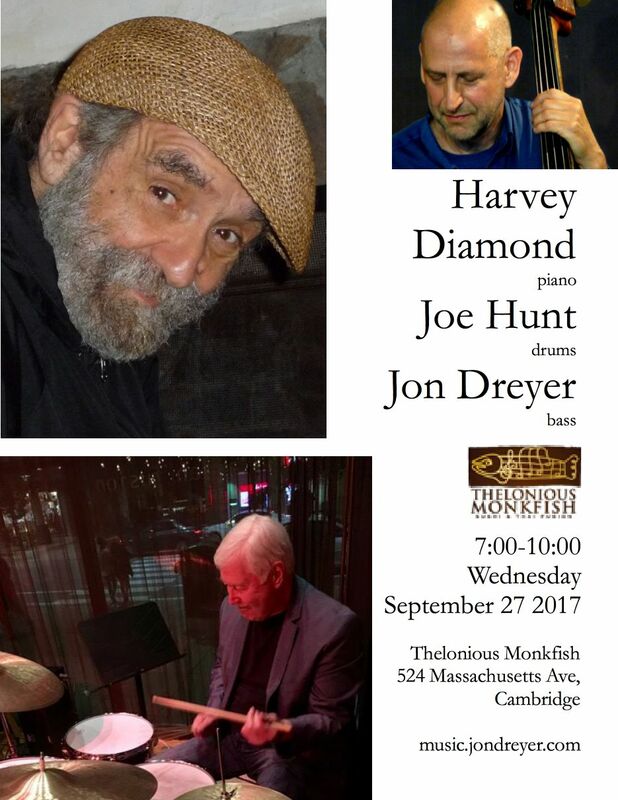 The legendary jazz pianist Harvey Diamond has graced the Boston area for decades with his music which is at once both deeply technical and deeply emotional to even the most casual listener. Over the years he has performed across the U.S. and in Europe. He was among Lennie Tristano's last students in the 1970's, and has done concert appearances with NEA Jazz Masters Sheila Jordan, Dave Liebman, and Art Farmer, and also with Charles Neville, Harvie S, Jay Clayton, Joe Hunt, Don Alias, Jason Palmer, Cameron Brown, Marcus McLaurine, and many others. After decades of patience by his fans, he has finally released his first CD as a leader, The Harvey Diamond Trio . Critic Steve Elman of The Arts Fuse says that pianist Harvey Diamond … is almost as revered among Boston musicians as the Dalai Lama is in Tibet. Harvey has been described as one of the unsung heroes of the Boston jazz scene since the mid-1960's, and is also a revered teacher. Bassist Jon Dreyer is one of Harvey Diamond's closest collaborators. He also performs regularly with James Merenda, both as a member of his band TickleJuice and also in more mainstream jazz settings, and has performed with most of the Boston jazz community, including Adam Janjigian, Yoko Miwa, Frank Wilkins, Phil Grenadier, Jason Palmer, Joe Hunt and Steve Langone.